cooper and phyllis were seeing each other? i never put two and two together until hastings mentioned that there was "maybe somebody else" or something along those lines, in addition to phyllis' affair with george. POSSIBLE PLOT HOLE: shouldn't the FBI have found footage of cooper appearing in the glass box?? alongside the footage of the experiment and cooper/weird monk guy? overall: this story is much more complex than i gave it credit for on the first watch. what an enormous puzzle. I never remember it being revealed Duncan is a tulpa. Where did you get that? oh. i guess it's never stated outright. at the very least, cooper's, what, blackmailing him, or holding something over his head? his bullet wound from chantal looked so completely fake that i assumed it had to be a tip-off that duncan wasn't human. Tulpas get sucked immediately back into the Lodge upon death, like Tulpa Diane. I think they just ran out of budget on special effects/makeup effects, that's why the assassination of Duncan was a bit cheesy. As for Phyllis, DoppelCoop is merely stating, in my view, that he was able to manipulate her by his understanding of human nature. In other words, she was predictable in her human frailties. Hmm. You're right about the tulpas I suppose. Why have the same "echo" effect when Roger and Phyllis die, though? Lodge inhabitants? I'd be very surprised if the Duncan effect was that way only because they ran out of money for effects. It just seems like something Lynch liked and fits with the current aesthetic. And yes, it could mean that something is up with that reality. Or not. But regardless, in the past Lynch has painstakingly constructed brain matter for head wounds. I don't think that would have cost much to construct a tangible fake head and blow it up, so it doesn't seem to me a matter of money, but rather a choice between digital or practical effects in the scene, and Lynch chose digital. But like most elements of the show, we'll never know. We know that the show had some absolutely stunning CGI, particulary in Part 8. The nuclear blast and the frog-moth are among the most impressive special effects in DKL’s ouevre, and as incredible as anything on, say, Game of Thrones. We also know from Pierre Buffin that DKL went out of his way to “dumb down” certain CGI that the studio produced, particularly in regards to the “tulpa deaths,” preferring a more prehistoric/flat look closer to the raw style of his own paintings. Given all that, it seems pretty obvious to me that the Phyllis and Todd deaths are the way they are due to conscious decisions (the morph was clearly added to Phyllis on purpose). Whether this was due to some deeper plot meaning or just due to DKL’s quirky awesthetic whimsies, we’ll probably never know. But it certainly is interesting that it happens on these two particular characters’ deaths, and I don’t think it’s unreasonable to theorize that something happened to these two after they let Mr. C into their lives, as Todd puts it. The opening scene, between the Fireman and Cooper... when could this have happened? The way Cooper disappears after the Fireman says "You are far away" is exactly how Laura's body disappears after history is altered. It makes me wonder if Cooper's sudden disappearance from the Fireman's Home is actually him being erased from that timeline. I think a poster somewhere on the forum thought this meeting may have occurred after Laura is grabbed away from Cooper before we see him in the Red Room again in Ep. 18. Laura isn't really being erased from the timeline - she still exists, but her fate has changed, and maybe it's the same with Cooper. He's not being erased from the timeline, but his path in the timeline just changed. Maybe he disappears in the same manner because he never ended up meeting with the Fireman in this course of events - no Dougie, Mr. C, the purple room, etc. I had thought there might be two Coopers existing in the same timeline, but I think there's a good argument that this meeting did take place right before Ep. 18 and the Fireman is just replaying for Cooper what he already heard when Laura was grabbed away and wants to get a message to Cooper before he is "reset." Ah. Thanks for that. Cooper was very close to Jack Rabbit's Palace in Part 17, he could have easily gone to see the Fireman after Laura slipped from his grasp. Even just from these first two parts, the amount of questions I have is so overwhelming. Figuring out the timeline alone feels impossible, but... I'm going to keep watching and keep trying to fit things into place. What is the deal with Tracey? I think she must have been hired by someone to befriend Sam, and infiltrate the room with the glass box. We very clearly see her trying to watch Sam input the passcode to the door. And while that could just be innocent curiosity on her part, I now doubt that. Tracey shows up the next day around 2:53pm PST. At the very time when Cooper appears in the glass box. What's more, the guard has vanished. That can't all be a coincidence! I think she arrived at that exact time to prevent Sam from seeing Cooper in the glass box. We don't know what Sam's protocol is if he actually sees something in the box, but he must have had some instructions from his employer. My guess is that there was a trap mechanism in the glass box that Sam could have triggered when he saw something. So who hired Tracey? Whoever it was who Mr. C was speaking with on his FBI computer in Part 2, probably. At first, he thinks it's Phillip Jeffries he's speaking to, but by the end of the conversation it is clear he does not know who it is. So many questions. But I do now feel that it's obvious that Tracey was not just some girl with extremely unfortunate timing. She may have just been a pawn, but her involvement in the story wasn't an accident or coincidence. madeleineferguson wrote: So who hired Tracey? Whoever it was who Mr. C was speaking with on his FBI computer in Part 2, probably. At first, he thinks it's Phillip Jeffries he's speaking to, but by the end of the conversation it is clear he does not know who it is. This is an interesting idea because to the best of my recollection, MIKE isn’t in the season 3 credits, with Al Strobel’s lodge character being credited as Gerard. Could it be that MIKE is out and about in Gerard’s body, and that when this happens the human Gerard appears in the lodge? Could it be that the human Gerard has died, and that this is why we (maybe) see him in the lodge? Have MIKE and Gerard somehow merged? Could it be that the credits are an error? I think that it’s a real possibility that the mystery voice is that of MIKE. People have also suggested that it’s Judy via the possessed Sarah Palmer, which is also an intriguing idea, since Judy was at least “with BOB” when BOB was spewed into our dimension, and perhaps prior to that event, in some demon dimension, not to mention being with him in terms of being with Leland. Leland, of course, was very much “with BOB”, but it seems somewhat unlikely that Leland would have the power to have this conversation with Mr. C., unless it’s a Leland in some other timeline or something wild like that. We could say that Laura was with BOB, not just in terms of being tormented by him, but also in those moments like when she says, “Fire walk with me…ME!” at Harold in FWWM, or when she shows the full-on demented grin at the ceiling fan in TMP. Josie was sort of, kind of, though not really with BOB in some way, as she did some evil actions and BOB does indeed collect her when she dies, but Josie really seems like the biggest long shot of all. Finally, a very kooky idea is that there is a Mr. C, sans BOB, going about in some other timeline, looking to take BOB back from the Mr. C. +BOB we see in the season 3 timeline. If I were forced to vote on it right now, I suppose I’d go with the mystery voice belonging to MIKE. madeleineferguson wrote: What is the deal with Tracey? I think she must have been hired by someone to befriend Sam, and infiltrate the room with the glass box. We very clearly see her trying to watch Sam input the passcode to the door. And while that could just be innocent curiosity on her part, I now doubt that. If Tracy was sent to distract Sam at the very moment that Coop appears in the box, it does seem likely that it would have been MIKE who hired her. MIKE has the motive to get BOB under control, and preventing Coop from being trapped in Mr. C’s box could certainly be seen as an important part of that goal. If MIKE is out in the world in Gerard's body doing something like hiring Stacy, it bolsters the hypothesis that MIKE is the identity behind the mystery voice speaking to Mr. C. It also bolsters the idea that the character in the lodge is actually Gerard, rather than MIKE, though I'm far from 100% convinced about that. Great to commiserate with you, Jasper. I've moved onto Part 3, and there is a mention of Mike. Just to keep everything easy to find in the future, I posted that discovery in the Part 3 discussion. Now, I'm mostly convinced that it's Mike who is the mystery man in Season 3. Still committed to stopping Bob, after all these years. Jasper wrote: This is an interesting idea because to the best of my recollection, MIKE isn’t in the season 3 credits, with Al Strobel’s lodge character being credited as Gerard. While the idea of Mr. C talking to the wrong “Phillip” has always tickled me, the NY reference pretty firmly ties the caller to Judy in my mind. It’s also significant that Jeffries later tells Mr. C he has already met Judy, although Mr. C doesn’t know what Jeffries is referring to; it could be this call. We know so little about Judy’s agenda, though, that it’s tough to develop this further. TFD provides us a kernel of insight into Mark’s intentions, at least: apparently, if Judy ever reunites with her male counterpart Ba’al while on Earth, the world as we know it will be destroyed. Many have theorized that the male counterpart is Bob; if so, this could be why she wants to be with him. If Judy needs to reunite with Bob on Earth, the other question then becomes: what exactly happens to Bob if Mr. C “go[es] back in”? Does Bob go back into the Lodge as well, or would he break free in orb form and float around the Earth, as seems to happen if Mr. C dies? The little kernels we’re given are maddening but fascinating. Is Bob Mr. C’s ally or his prisoner? Why do the Woodsmen seem to be Judy’s allies in Part 8 (facilitating Sarah’s possession) but actively work to keep Mr. C alive and to keep Bob inside Mr. C in Part 8 and Part 17, seemingly working against Judy’s agenda? Are they serving both sides to achieve some goal of their own? Meanwhile, what are Mike and the Arm up to? Are they still just pursuing their own agenda of bounty hunting Bob to get the garmonbozia he keeps hoarding, as in FWWM, or are they somehow involved in the bigger game? Jasper wrote: The little kernels we’re given are maddening but fascinating. Is Bob Mr. C’s ally or his prisoner? Why do the Woodsmen seem to be Judy’s allies in Part 8 (facilitating Sarah’s possession) but actively work to keep Mr. C alive and to keep Bob inside Mr. C in Part 8 and Part 17, seemingly working against Judy’s agenda? Are they serving both sides to achieve some goal of their own? Meanwhile, what are Mike and the Arm up to? Are they still just pursuing their own agenda of bounty hunting Bob to get the garmonbozia he keeps hoarding, as in FWWM, or are they somehow involved in the bigger game? I think finding coherence in this part of the story is a fool's errand . It's a nightmarish world, where not everything makes logical sense. 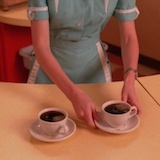 Re: Tracy, I've always connected the Z on her lattes to the exaggerated Z on sZymon's coffee shop sign inside the Lucky 7 building. I would otherwise conclude from this that Mike is the one who sent Tracy (with or without her knowledge) to distract Sam while Cooper appeared inside the box... however, this leads to a somewhat dubious implication that Mike is responsible for Judy entering the world... something I feel like he wouldn't allow if he could help it.